FOREWORDS: February 28th, 1999: On a picture perfect Sunday afternoon, I traveled for four hours from Nebraska with two Jamaican friends, Dawn Scott and Eric "Bucky" Morris, to Kansas City, Missouri to see Luciano. We skirted the eastern edge of the city to get to the Baymont at Hillcrest on I-435, where we linked with the Firehouse entourage at about 4:15 p.m. Paul Banks, of Nuff Things Management, along with Copeland Forbes, now manage Luciano. Fatis Burrell and Exterminator are past tense for a variety of reasons, some of which were discussed in the interviews. I was very much looking forward to meeting Luciano again. His music has been in frequent rotation on my radio program over the years and his latest effort, Sweep Over My Soul, clearly represents some of his most inspired work to date. We first met with Dean Fraser, who gave a nice interview on the subject of his work with Luciano. It would take hours and hours to start to touch on Dean Fraser's whole career -- that is for another time. After Mr. Fraser, we went to talk to Luciano and his close bredren Mikey General. 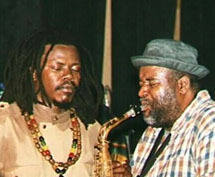 When we entered the room, Luciano and Jah Mikes were listening to "Living Dub Volume II" by Burning Spear. Luciano picked up a fife and began playing skillfully with the music. Luciano had his locks up in a beautifully hand woven red, gold, black and green tam. He looked like every bit a princely character, with all the dignity implied therein. Part of this is due to the fact that his dreadlocks have reached shoulder length and have a certain mass and impact to them -- a good four years' growth -- like Bob Marley circa Rastaman Vibration or Kaya. However one describes it, Luciano doesn't look like any kind of Rasta-come-lately. I have images of him in my mind through the cloud of smoke that twisted off the spliff he was smoking -- or maybe it was from mine, but those hazy images remain. It was a very heartical hour. 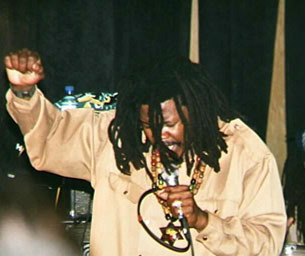 Luciano, give thanks for the time. I appreciate it . . .
Give thanks my brother, blessed. Good to see you again. Give Isis (praises). I want to get your perspective on what's happened since your break or divergence from Fatis and what the situation is now. . . what happened and where you're going. I give thanks . . . I definitely have to give thanks for all the contribution and the work done by Fatis, by Mr. Phillip Burrell, cause he has done a lot toward the uplift of I&I soul and to the music itself. These times I have made just a personal thing in I&I own self. I feel and know in myself that I reach a stage where I can make certain stands. And even though Fatis is a great producer -- to the capacity that Fatis has been in my life as a producer and manager and so many different things. I decided that I could make certain stands towards having a personal manager as opposed to him as my manager and counselor and producer. But my objective is just the same. My mission, my visions are just the same. I definitely have one intention: To continue to spread the positive message in I&I songs. And this is what we are all about, as messengers. Nothing really has happened between Fatis and I. Is jus a stage where as a truth seeker and one who is an inspirer for those who are out there. I received a spiritual initiation. With this initiation comes a couple changes. Cause even in our band the Firehouse, we have changed the percussionist also. So we look forward to higher heights of music. Just more music. How did you link up with Mr. [Paul] Banks? Well, Mr. Banks has been definitely associated with I&I and affiliated with the whole Xterminator Crew. He has been there, even doing producing in the studio with I&I, many gigs, outdoor concerts that we have put on. He's been very instrumental in getting many of these gigs on the road. He's been there from ever since. Mr. [Copeland] Forbes and Mr. [Dean] Fraser and whole Firehouse Crew is still with I&I, and my brother Mikey General is still with I&I. What would you say . . . I was asking Dean Fraser this exact same question . . . When you were with [Fatis] you had a certain sound, but I didn't know what all the components were. If that was just because of Dean Fraser or Sly Dunbar. What would you say Fatis contributed to your sound that might be different now? There is no doubt that Fatis has good hearing, and he has a speciality in listening to sounds and knows what people are gifted for. And he knows how to designate them or appoint them to be a hearer -- the way they fit best. He is good in selecting musicians. There is no doubt about that. He's worked with the Firehouse. He had the faith and belief in that. Same way in which he had the faith to work with I&I. He is good on that. He's able to spot the qualities in people in terms of music and qualities. And this I could definitely say, I have to give him the merit towards that, because he knows to find the right saxophonist in Mr. Fraser, the right drummer in Mr. Sly Dunbar, right bassline player, Mr. Donnie Bassie [Dennis]. 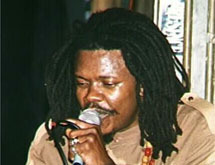 Right singer, Luciano. So he put the people together. So how about the sound that came out? As you know, once people know their position and what their duty is, so once we are in the studio, we automatically fall into place. We do the best we can in whatever we are specialized in. So I&I do I&I best as a singer. Mr. Sly do his part. So we just fit in actually as good musicians. We automatically come up with inspiration and vibes. And Fatis is always there whether he has an idea to bring in a different sound, whether a fretless bass or a normal bass, or to bring in the acoustic guitar as opposed to an electric guitar. So it's just his specialty is [picking] instruments and musicians. But like anything else, any producer from anywhere in the world come and get the same musicians and put I&I in the studio, we're going to do our best. We're going to bring out the qualities, so in as much as I have to give him the merit towards selecting and finding and hand picking certain people towards his production, we still have to give the merit also to the musicians who have actually put and presented their souls within the production. So it's a combination of things really, and once you have good people together, good musicians, you're gonna get good sounds. Some of the great cuts you've recorded over the last five years have been over rock steady rhythms remade. Where do some of those concepts come from, cause I know Sly has an interest in Studio One sounds . . . Particularly on the new album you've got this track "Ulterior Motive," which is . . do you know what the original rhythm is . . . is it a Treasure Isle? [Sings] . . It's "Stealin Stealin" I think. John Holt. But it just sample. That's a great sound. In fact it may be the strongest track on the album. Let's talk about the album Sweep Over My Soul. This is the last thing Fatis . . . Fatis oversaw all these tracks right? This is kind of the last Fatis project? Yes, certainly. Might not be the very last because he still have a couple tracks with I&I still. I wouldn't jump and say it's the last really, but since the reforming of I&I, this is the album that has come out, recently. Overall, when I feel the mood of this album, especially right here, the way this is sequenced, through here [pointing], this is some of the most serious, heaviest, rootsiest sounds . . . "Hold Strong," "Final Call." These are some deep, deep tracks. Not that you haven't recorded deep deep tracks, but overall is that an accurate perception? Okay, you are definitely depicting the right vibes from it. I say definitely you know. I'm really a singer from the people, of the people and always with the people. So as a result of this, I would have to emphasize or make known some of the problems that we face in the ghetto and people on the street. So I&I say as a Rasta, as a Rastafarian singer. I haffe keep them rootical vibes in I&I work. I will vary it a little, with a little up tempo, with a little salsa or samba now and again, but I'm really original a rootical, spiritual singer -- cultural, rootical singer. So as time progresses, you will hear more and more of this kind of vibes coming out of I&I. Cause I definitely see where I am blessed in this way to use I music to help elevate and educate I people. So this is why I say, at least three tracks haffe direct to ghetto youths, poor people, every man in the street -- the raggamuffin who have to face it from day to day. Cause the system is definitely an impediment in I&I way. We were talking earlier about how this kind of sound, a more rootical sound, has been [desired] internationally -- that's what people have always wanted to hear from Jamaica, cause that's what they first hooked onto with Bob Marley and Burning Spear and things like that. But then Jamaica went a different way, with "Sleng Teng" and when dancehall became a more computerized sound, a more stripped down sound. But now, in the last, let's say four years, and you to me represent a leading part of that return. So what's the change in Jamaican people to be more receptive to that, cause you can't just record something and totally ignore Jamaican people. It has to be something that Jamaican people are ready for. Well, I tell you honest truth you know. Once the music is good, people in general love to hear new sounds. And sometimes it doesn't matter if it's Nyabinghi or computer. But since the invention of computer I realize a lot of change have really taken place. So the renaissance and the consciousness really has come about. Mr. Sly still use his computer drums in many of the tracks. So we still apply the same steady beat, steady rock attitude to it and bring out the same vibes out of the same computer. So even though mankind invent all these things, I realize with I consciousness that it doesn't matter. Because whatever mankind has created, it is the same thing that we haffe go use fe help them fe come forward. Is just like a journey. If you take a journey away from the main track, you still haffe go journey forward pon de road that you have missed. And come forward pon de main track, so I say all these computer and all these things, is just for I&I to use it, because I see the advantages in these things. There is no doubt that the computer is steady. Once you get a beat, you can get that steady count from it, so the music is even steadier. Not saying that it wasn't steady from 60s, 70s. But we can study and realize that the steadiness of the music has brought about a certain level of perfection in the quality of the music itself. Even though it may have lost some of the authentic sound of the acoustics, still with experts like brother Sly and Donnie and Mr. Fraser, we have brought forward I&I consciousness into this era now. We realize that we've brought back the band into the studio. Cause this is what is happening now. All what has happened has transpired but the consciousness of man has grown. And there is no doubt that we have exhausted the computer. They created all different sounds and mankind still realize that something is missing, and this is why [we are] continually heading forward fe the foundation. Same way with the mind of man. Even though they invent and create all different kind of things, there comes a time when the soul start to cling to the roots and want to know more about the roots, to be more associated or affiliated with whatever goes on within the roots. So this is what I see happening. I'm just proud to be a part of the renaissance. I couldn't say all the merit go to I. We haffe give thanks fe everyone -- every mouth that has come in the name of righteousness. For brother Burning Spear who has always been there, holding the one-two steady beat. I say I give thanks because I always see a fulfillment coming out of the music because of the works that they have done already. So I always have the faith to know, yes, these pioneers have laid the track -- Robert Nesta Marley, Peter Tosh, Mr. Bunny Wailer, Mr. Dennis Brown, Beres Hammond, just to name a few, Third World, Israel Vibration. So I say, I just feel happy to be basking in this great heritage, because even though so many youngsters have followed the computer age, I never get caught up in it. I don't even have a computer in my home. And even though I realize the work still is being spread through the computer. Cause one can tap into the Internet and get a lot of information, so I can only beseech mankind to use whatever they have invented to help them to be reconnected to the one grand spirit of life. Yaweh, Jahoviah, I am that I am, whatever name -- the All Good, the Supreme Being, Creator and sustainer of all existence. Give thanks. Seen, beautiful. Musically, Dean Fraser just said he recorded an album with all acoustic (unreleased). Do you see yourself on some full live studio rhythms, where there's an actual drummer in the studio. We have laid of couple of that, and even some of the tracks on the album [Sweep Over] . . .
For real? Tell me about that. Let me look through this . . . [looking at the cd]. "When Man On Earth" is one of the tracks that we have laid. I think Father Sly do have a way fe create an authentic sound out of these things. Mikey General: "Hold Strong." I think "Hold Strong"
Luciano: "Hold Strong" is another. CVP: The high hat is the place you can hear it, but sometimes I wonder if they don't loop an actual recorded high-hat. Okay, I tell you the honest truth. Father Sly is a professional when it comes [to this]. So he definitely can create all different sounds out of a computer still. But he definitely specializes in acoustic still. He loves the natural authentic sound. And as time progresses, you gonna hear more and more of I&I with the Firehouse Crew, now we're getting tight and moving towards . . . We're going to live in the studio, my brother. The next album coming out a just live! Live fire! Yea mon, because as we say, we pull through a stage and pull through an era where computer has really made an impact upon the music fraternity. And for those who have not taken time out to study the music properly or master an instrument, they probably have gone astray, following the machine and the computer. But for those who know the importance of music, authentic sound and knowing an instrument, mastering an instrument somehow. They will continue to cling to the roots like I&I, Brother Mikey General here. As time progresses, our consciousness grows, our spirit expands, and facilities comes in tenfold. So we find better ways of bringing forward the message to the people. When I came in, you were playing the fife. And on "Can't Stop Jah Works," I assume that's you? Yea, my lickle [input] . . . and even the [lead] guitar too. Ah, this is to the effect that I&I have been a part of the production. I have been to the studio more time with my lickle instrument, adding my little spirit, cause this is the secret of every good production. The artist must be involved, from jump street, from scratch. We must be there. Instead of just walking in and hearing tape. . . Instead of walking in and hearing a tape. You can have the good ear to just walk in and hear the riddim that suits your soul, you know, and find something compatible to it, but it's best to be there from jump street. You've been with Mikey General for a long time. Tell me about this bredren and the association. Yes mon! I met up with Jah Mikes in about 93 Jah Mikes? MG: 92, ending of 92. Luciano: Ending of 92 coming onto 93. Always been moving around and meeting people and brothers an ting. But when I met up with brother Mikey General, I met him at Mr. Castro Brown's, that's New Name Studio. And I tell you man, from then on, I just cling to the brother because he's a good brother. And people always searching fe find a clean spirit who will strengthen you. Like the same way you would strengthen them. Iron sharpeth iron . . . Yes, and he's born October like myself. . . We just gwan push the fire on Babylon. He and I went to Fatis almost in the same time, and we started working and we work and we build that. We nuh wan hesitate mon, some late hours a night inna his studio, a burn fire me a tell you! Another track, there's a lot of tracks on here that just struck me as being particularly strong. But "When Will I Be Home," tell me about that. Okay, well. . . In I&I concept of repatriation. I know it's not anything a go just happen haphazardly. Brother Marcus Garvey has come with a very powerful vision and with all his endeavors, we realize that it didn't happen, so I say within I&I consciousness and how Jah have taught me. He say mankind, black people wasn't ready yet fe de repatriation ultimately in terms of thousands of people packing up on the ship to go back there, because people have to come to really appreci-love their heritage and their roots firstly before they can even think of going to the motherland. Cause I say many still want to go there with their Western concepts and understanding. And I know the land going spit them out. Many have tried and then haffe run come back, because they never went with the right attitude and perception towards the Mamaland. I have been there. I went to Senegal. I went to Goree Island where all the slaves were taken from other parts of Africa . . . And Brother Mikey General and I&I Sizzla, and Fatis, we went. I think it was 97, the middle part of 97. And we went there and we went to the door, they say the "door of never return." Alright, if you notice I even mention about Goree Island in the song, and I mention about Senegal and all those great ancient souls. Cause we really learn about some Bifals[?] from St. Touba [?]. It's a place further inland, more in the countryside in Senegal that the saints used to go and pray and have their meditation and so. Even that visit and that pilgrimage to Africa, it brought something to my consciousness cause I realize that when I went there, the Western Civilization and the Western monopoly has had a damaging impact upon the people there. There are many who are just dreaming of coming to Jamaica. Some dream of coming to America. Some of them dress up in jeans and all them ting deh. But majority of the people still hold onto the anciency, cause you know, no matter how we've been attacked I&I realize that the anciency is so strong. Cause the anciency is God in I&I. The rightful livity, the rightful concept, the rightful rituals and practices of I&I have been handed out to all generations. Now I say even with my recordings, I still have to keep focused upon the whole plan of repatriation. I say I haffe play I part, I have to keep singing and reminding I&I people. So even how I mention about reminiscing, sitting and wondering and thinking and knowing that yes, I haffe go back dung dere you know. I have to be there as a soul who have acquired certain knowledge and realize certain truth. It is my duty to take my mission towards that direction. Because really and truly out here in Babylon in the Western Hemisphere, my part of the work is tying up. Cause I say after I have exhausted certain dimensions of I&I works out here, it is my duty to take it to the Motherland where we need it more than ever. So this is always, I did "One Way Ticket" emphasizing the situation [of] people suffering out there. We haffe make it back home fe really make it in our life. And "Back To Africa," Fred Locks . . . Yes, I definitely think it's for the beauty of I&I fe add a song about Africa in every one of I&I albums. It is important to mention and to have something pertaining to the Motherland. On that trip to Senegal, is that where you made a link with Baaba Maal? I met up with him before then. Actually, it was an extension of his courtesy why we went there. But he came to Jamaica. He visited us, and we showed him a lot of hospitality and love, and so he invited us over and we went, and we had a wonderful time mon. So my next visit, no doubt I will look forward to, because that was the more Westerly part of Africa. I look forward to being more in the Easterly part. Yes, I just have that faith now that Jah somehow has a very important part in all mi journeys. That the Almighty God have a very important part to play. I hail Jah Rastafari. I hail Emperor Haile Selassie I. I hail Jesus Christ. I see the one tradition of the people who have held onto the principles of righteousness all this time. Just I&I same way, right through the line. And as it is promised in the Holy Book that the throne of King David will never go to ruin. I&I see I-self as a chief musician likewise Brother David, cause King David came in the name and vein of music! So I&I as a musician now feel honored to heralded in the same line and manner as King David -- singing for the people and reminding them about the Almighty God, their creator, their maker. Cause we didn't just come so. Mankind didn't just crop up on the Earth. There must have been some great thinking to see how we're fashioned! With hands to grip, with feet to walk as I&I chariot. With minds to think. There must be a mastermind behind all this. And this is always my true conviction that keeps I propelled towards the uplift of the nation. So tell me now. You're talking about repatriation in the physical sense, and I've reasoned with Mutabaruka, who says yes, I must go back. Burning Spear says repatriation is a spiritual and a mental journey. But it's obviously both . . . It's both. Repatriation must a complete ting. Must be manifest everyday in the spirit and also in the physical. Cause it makes no sense for a Rastaman to be in his heights in Manchester now or Jamaica and beating his drum and singing [about] Africa and no go deh. Haffe go dung deh mon. Go spend some time. Go run up and down pon de sand. Or meet some of the beautiful women and have a dialect! [laughter] So, but I say before the physical repatriation can come into manifestation, there has to be a mental or a telepathic repatriation. There has to a reaffirmation within the consciousness of I&I saying, yes, I am a son of such and such a side. I want to be back there on mi Motherland. There must be something that really wants you to be back associated or reconnected to the fold. I was alluding to the fact, cause you recorded that track with Baaba Maal, but you've had the opportunity to do "Just Like The Wind" with an African sound to it. Are we going to hear more of that kind of thing from you in the future? Certainly mon! We're going to hear more of that fe true. More African. Because you see, that's the repatriation taking place even within I&I own consciousness. Is a repatriation taking place. The more I draw closer to my roots, the more I draw to I&I livity, to I consciousness, to whatever I do. My practices, how I eat, how I deal with people, is the more I become incorporated with the whole anciency. So the music itself is an expression of my soul. As I&I grow and we consciousness expands, then you'd also find a variety in the music. The more so clinging to the roots. On this track, on the sequence here the last track, called "Poor Youths," the way this chat that you do on here, "Stan-a-nee-tee-woi." That's sounds just like Michael Rose to me. Where did that come from? Stan-e-nee-tee-woi to me is a sound that is like a slave balling out. Is like an old slave cry. One of those. But you know Michael Rose popularized that? Notwithstanding, I say to I-self that, because I see this as a beckon. Is like a beckoning sound. I find honor in everyone's contribution. I say no matter what, even to use that to me is like giving honor and respect to Brother Michael Rose and everyone, cause he is not the only one who has used it still, because all sounds were there in the beginning. So we just give thanks that we can bring it forward in the consciousness of I&I in this time. But the cry of the poor people really have to have a sound that brings out a beckoning. It's true mon. When I did "Crazy Baldheads." When I listen to the voice and listen to Brother Bob's voice, I say there is a slight similarity and it happens when I'm in the studio. Every human being has the power still to assume the sound of other beings or creatures. We have the power. A mon can make sound from now right forward into creation. Cause we have the mind for that. Within us, within the flesh, is a mind that is so powerful that is unbelievable. Sometimes I can create sounds, but I rather to stay within I&I vein of expression, as a spiritual one. If I even touch on a sound, it must have a sound sounding like a real rootical singer or someone who has really contributed. But Frankie Paul specifically, is he a singer that you . . .
Me a grow up listening . . . I'll put it this way, we're both baritone singers you know. Cause we have the big voice same way. Sometimes the similarity comes, even with Brother Dennis Brown, I find some similarities too. Sometimes I do certain song onstage and my whole voice change. It moves with the spirit. Sometimes we come bigger, sometimes elevated. Bucky: I was talking to my friend President Carter this morning and I tell him reggae music is a free spirit ting. True mon, yea mon. Ya haffe jus come in true. Come manifest inna it and be powerful. Another thing. Now that you've traveled. You've traveled from country to country. Tell me about what you see as the state of reggae in America compared to Europe, or . . . have you been to Japan? Okay, so you've really seen some things. And South America? Paul Banks: We're going to Venezuela for a festival on May 22nd. PB: We're trying to go to Brazil at the end of the year. CVP: You could probably fill a stadium there from what I hear. It's big there. Just give me your comparisons . 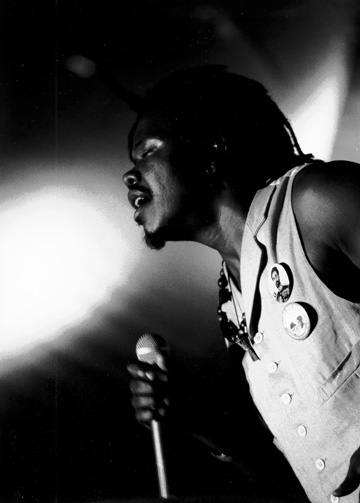 . .
Luciano: Give thanks. I realize that right around the world, people are really catching on and realizing even from brother Bob Marley has come and laid the foundation -- all the great musicians. Reggae is no doubt . . . reggae has paid its dues -- put it that way. And reggae has been recognized as a world phenomenon. Like in America, the R&B kind of has an impact on the people. But we know all music deriving from the one root. The voice of the reggae music, it has a slight tinge . . . It has an additional spiritual power to it due to the message. Because the message that comes out mostly in the music is sufferation and the manipulation and the abuse that we face. And we offer alternatives in the song. This is why it is so powerful. It gets a fight from society. Because even the song "Poor Youths" -- they ban it. They ban it in Jamaica. How do you mean? When you say that, what do you mean? They don't allow it to be played. And they ban it cause I mention about bauxite companies and Alco and Alcoa and Kaiser. Yea, I mention about how they're digging out the loom out of the Earth them. Because I&I blood shed fi it dung a Jamaica already. And we still see seh them ya lickle or no recognition down there still. But when I point out to the effect that the little piece of land that we have left we couldn't do a lickle farming. They taking it away from the farmers, people who is just live on their nice lickle piece of land. They pay them little or nothing. They give them a different house, different place that they can't even plant pepper. And they dig out the whole of the knowledge and the loom out of the land. I say to myself, that to me is sacrilege. So when I hit out that way deh them ban it. But the work cyan stop . . . [?] . . . them haffe go ban the whole album then mi breddah. I was talking about this cause it was an important thing when "Fire Pon Rome" by Anthony B came along. That was a banned song. Do they try and prevent it from being sold or distributed? They have no power over that, because backroad [?] deh alone back over that. Yea, that's what they do. Paul Banks: They have charts. When they play the top ten charts, they say, 'the number seven song is a song by Bounty Killer or whatever that can't be played.' But sales skyrocket. Luciano: But we realize, I think that the Church, the radio station, and the politicians, the whole of them link up mi breddah. Unfortunately. Church and state! [Laughs]. The only reason me can come out right now and speak these words, sound, and power and nuttin can touch I&I. Because you're under the seal of the Almighty God. Whatever to be said has to be said now. Someone haffe say it. Someone would have to come and cry out against the wickedness and the sacrilege that I&I have to face from day to day, right throughout creation from the four corners of the Earth I&I observe and see wickedness being handed unto man. And when I say this, it's not only black man going through the suffering and the pelting. Humanity alone because of transgression. And erroneous beliefs. They keep running this rat race and killing off them one another mi breddah. And this is not right. So whatever I can do to send a message with the music that beat, music and I&I livity too. Whatever me can do, visiting the schools, even with mi guitar. Cause when they ban it pon the radio, the soundsystems will play it! I can't believe they never learn. That's why we haffe give thanks fe de soundsystem man. Bucky: A lot of people them hear it, but them don't see the message what it carry. Look at down in Jamaica weh we from, our land. They're digging out the vegetation. They mashing up the land. They ain't producing nothing. And you try to show the people them not to do it, and they ban your song. That mean you're talking reality! Luciano: Them no wan me touch pon dem topic deh mon. Them wan me sing . . . [Luciano breaks into an outrageous caricature] 'Ooooohhhhhh, my love for yooooooouuuuuuuuu. . .' There can be no, no love without justice and equality and respect throughout all territory. Cause people come talk about love and love and a hungry man, a youth who a starve. Me nuh see nutting wrong with singing a couple of love songs and ting, but I cyan become too secular. I&I haffe stay pon a spiritual track weh, cause someone would have to come and come do this. Bucky: Every mon have certain cross weh him haffe lift up. An jus so it go, you know? CVP: One more topic I wanted to get on. Since you left the Xterminator camp. There was a lot of controversy last summer around Sizzla, and he's not traveling with you now, but he always was before. Tell me what's going on with him. Luciano: Well, with Brother Sizzla and I&I, I realize that we reach a stage where my philosophy and his philosophy were not in agreement. I still don't believe that he has conformed to I&I beliefs and philosophy. I'm not forcing anyone to, but I say I notice in terms of how he approaches the stage. Sometimes he might use certain words, which to me is guile. I got in the Bible and I show certain like, James 3 and say to him, my brother, I'm not saying that you don't feel the fire -- I feel the fire too -- but I have to control I-self as one who Jah has appointed. I have to act accordingly. So I say, if you gonna be a preacher of the gospel or a preacher of truth or whatever you're preaching to the people, you still haffe conform to certain principles, cause you have to remember I was there before you, working hard with Brother Mikey General here in the studio some various hours, when Sizzla came along as a school brother in his school uniform. I&I take him into the came, and we embrace him and we watch him grow. . . Yes mon. He's young mon and him kinda slightly stubborn too. I realize that he has held steadfast to his principles, which to me if he was willing to listen to I&I, he would have conformed to I&I principles, cause I sing out of the Bible still you know Jah. I coming out of the Ible and if I can sing about Jesus Christ and sing about God, sing about the Father, sing about togetherness, sing about . . . Because nuttin nuh mean, music . . . I&I music wouldn't mean anything if I wasn't based on the foundation. All foundation go back to righteousness. Cause it's the righteous livity gonna save I&I. Cause remember when Jonah was sent to Nineva, the message was that if just one of the people in the city should change from their crooked way, then the city could be saved. And this is the message I come carry same way. Nothing has changed. Only thing is that we have more knowledge and big stage light and all those things. . . I could not conform to Brother Sizzla, and he used to use guile words. I don't know if he still use it. What about what happened at Sumfest. It was reported in the United States that he was bunning Kentucky Fried Chicken and all these things and he said 'burn all white people out of Jamaica.' Is that true or not true? I tell you honest truth. He has been doing a lot of burning -- a lot of bunning, which I didn't agree with. I say, a man can burn, because I burn rubbish and burn certain things, but what sense you gonna make then if you a come out like that and just burn without a reason or without control. They say love without knowledge is no love at all. To burn without knowledge is dangerous to I&I also. Jah say, 'judge not that I&I might not be judged.' I&I see a lot of corruption going on. If I am working on a stage and I see like they put . . . like some stage I see they sneak and put Craven-A advertisement, a cigarette advertisement along the stage. I only wan see it mon, from early it haffe tear down we burn. Cause to me it's a bag of hypocrisy to be onstage singing about God and Jah and then this thing advertise and using my name and popularize fe come advertise. Me haffe tear it down. So I burn fire, ya understand? But where I&I people concern, Jah seh we haffe be long suffering and forebearing with love and take time and work this out. All the blood spilled already. We cyan afford fe spill more blood for the spilling of that blood. I say whatever recompensation we fe get we fe get it with due respect. But we cyan go about it in any draconian manner. And as a Bible-mon I point out certain passages to [Sizzla] and he didn't listen to I&I. It reach a stage where I&I is a forerunner and a brother who the people in the world look to, cause they know that I am talking the truth. Me nah nuttin a go run no corner. If you cyan conduct yourself as a minister, you a guh get dethroned. Them a guh take you out of the church. So that is what I&I about mi breddah. So it's only that you know? His conduct was slightly not conforming to I&I. So this is why this stand we did haffe make. I pray for him still that him can get himself together. When it comes to the matter of Christ, because his attitude towards Christ also, even though we know that J-E-S-U-S -- that spelling that handed onto I&I and the whole fabrication surrounding that. We have been tricked once more by the oppressors, presenting to I&I a Christ or an individual of Christ that doesn't look like I&I. To me that is a great blunder they have done to I&I. So in I&I effort to bring forward back the consciousness to the people to let them realize that God lives in them. We have to be able to associate them with the roots, associate them with Emperor Haile Selassie I, who is I&I king and comforter in this time. Who has come in the same lineage of King David and King Solomon. Even saying anything about Christ, we still have to be reverent about it. We cyan just come out and come say, 'oh dis and dat and dat, burn dat now!' We have to come and tell the people seh, 'people, we have been given this name,' but based on how I&I understanding, there is no "J" in the Hebrew language, the nearest you could come to an English interpretation for the name would be Iesos. But I reach a stage in I consciousness now where I say I don't make that bother I. I say the name might change but Christ remains the same. The way is the same. Ahh. So no matter what name you try to fabricate and put to us when I read through and see the principles of the Christ, I realize that I can apply these principles to my life and bring about a betterment of I&I own existence. So this is what I do. Whatever I have to say to shed a light on the topic, I do it with intelligence and moderation and knowledge. I don't just come out and just cause no confusion. So this is really where I&I stand right upon creation. A man has to stand for what he believes in. Understand? So I&I stand for that. Righteousness. If you don't stand for that, you don't stand for anything. I stand for righteousness and purity my brother. So Luciano, that's all the questions I'm going to put you through. You can put that Mikey General in the hot seat. Certainly mon. Give thanks. Nice questions mon. Wonderful interview. AFTERWORDS: The show at the Grand Emporium was sold out at $18 a person. There were probably 400 people in attendance. Much to my surprise and delight, Mr. Soljie Hamilton was there to mix the show. The evening's setlist included: He Is My Friend, Never Give Up My Pride, Jah Makes The World Go Around, Ulterior Motive, Sweep Over My Soul, Over The Hills, There's No Love In The World, Your World & Mine, He, Crazy Baldheads, War, One Way Ticket, Who Could It Be, How Can You, Good God, Final Call, It's Me Again Jah, Messenger, Give Me Strength with a gospel/revival interlude, In This Together, and ended with Just Like The Wind. Sister G of KKFI presented honorary citizenship to Luciano and Dean Fraser for their musical contributions. Dean Fraser was noted for his work on the Lauryn Hill album, which had just gathered five Grammies. Not only was the show sold out, but one got the impression from the energy and excitement around the venue that Luciano is truly the torch bearer for reggae's future. I didn't need much convincing of that.